CERTIFIED BPA FREE. Our transparent bags are made of high-quality strong PVC material that are Certified BPA-Free & Lead Free. Don\'t risk your health with other uncertified clear plastic tote bags! LARGE CAPACITY CLEAR BAG: around 23x 15.5*3cm/9.05*6.1*1.18 inches. This PVC clear bag with gold chain and durable texture for comfortable carrying. It can storage your business cards, phone, wallet, and some small items. It is great for daily use, you can take it for party or shopping. 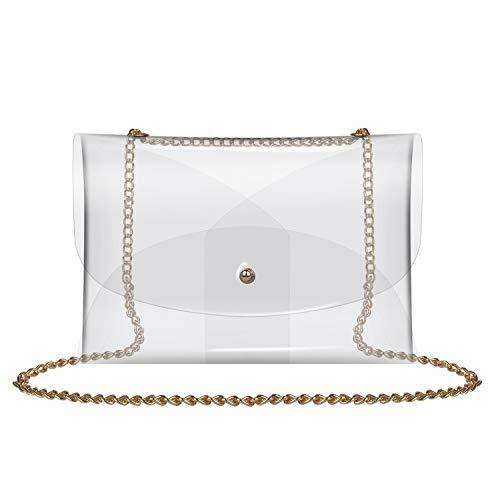 MODERN DESIGN - If you wish to catch everyone\'s attention and stand out, this elegant and stylish clear PVC bag is a must have for you! Featuring a transparent body, a colored fabric bottom and long matching handles, it is incomparably trendy and striking. NICE GIFT - If you want to give a gift for female friends,this clear stadium security bag a nice gift options and will meet all your demands. 100% MONEY-BACK GUARANTEE! Try our stadium bags and see the difference for yourself. If you are not completely satisfied with our clear crossbody purse, we will gladly give your money back, no questions asked!